Description - Our tough residential rolled rubber flooring is the perfect choice for the home user. 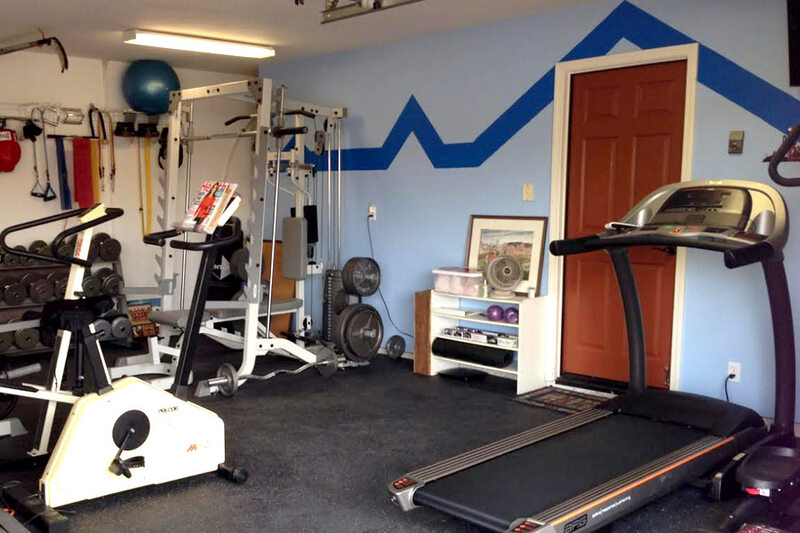 It has the same appearance and functionality as the type of flooring used in commercial gyms but is designed specifically for home gyms. Each roll is precisely machine cut so rolls can just be butted together at the seams and no messy seam sealer is required for installation. The rolled rubber is also safe to use both inside and outside. Material – Recycled rubber buffings and colored EPDM virgin rubber flecks. Recycled rubber buffings are the “Filet Mignon” of the recycled rubber industry since they are the cleanest, strongest, and most consistent raw material as compared to some of the cheap recycled crumb rubber alternatives available. Recommended Uses –Tough rubber rolls have been used successfully in home fitness gyms, as exercise flooring, under exercise equipment, in doggy day care facilities, locker rooms, as basement flooring, on decks and patios, in kid’s play rooms, in locker rooms and any other place where a rubber floor solution would be useful to help prevent slipping and provide anti fatigue and sound dampening qualities. 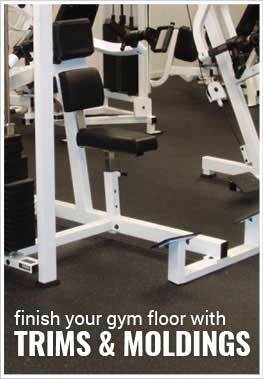 Made for home gyms, exercise rooms, and play rooms. Backed by an industry leading 5 year warranty. Does water roll off when this is used on an outdoor patio, or does it absorb or retain the water in the rug? Our 1/4" Tough Rubber Rolls are somewhat porous and will allow water to run off of the roll if it's on a grade. If there is no grade, then the water may collect on top of the roll. The water would evaporate, but any salts or sediments will make their way into the pores in the floor. I am trying to soundproof a second floor condo. Has there been any tests on this product for using as underlayment for a free-floating laminate floor? Our 1/4" Tough Rubber Rolls can be used as underlayment, but they are not tested for that purpose. We do offer 1/4" thick underlayment that has been tested. Feel free to take a look at that product and others on our underlayments page. I want to use the 1/4" rolls in the waiting area of my martial arts school. Is the flooring stain resistant? There are occasional, coffee, soda, etc. spills. Thank you for your help. Our 1/4" Tough Rubber Rolls are stain resistant. If a liquid were to get spilled on the floor, we do recommend cleaning it immediately. If the liquid were left to evaporate, some of the liquid may get stuck inside the pore of the floor. This makes it almost impossible to remove without damaging the floor. I'm looking at the 1/4" rubber rolls and wondering if suitable for driving a car over (resting a car on). We intend to use in garage as a floor for indoor basketball, but on occasion, there will be a car in the garage. Additionally, what do you recommend for adhering the roll to the a concrete surface? A car can be driven over our 1/4" Tough Rubber Rolls. The only issue that you may see with having a car on rubber flooring is when a vehicle is leaking oil. The oil from the car can over time break down the rubber. To adhere the rubber to concrete, we recommend using a polyurethane adhesive or our 5900 adhesive. Is your rubber 100% natural? Our 1/4" Tough Rubber Rolls are made from the treads of recycled truck tires. Most of this material is made from SBR which is a synthetic rubber material used to make tires today. I am extremely happy with my new purchase. Other than the smell of rubber, which has been fading over the past month, we absolutely love our rubber flooring. I feel as though my family has a legitimate gym in our garage! Thank you, Rubber FlooringINC! I recently purchased this rubber flooring to match the existing flooring in a fitness gym. It wasn't as easy to abut the center pieces as I thought it would be. I did have to do some trimming because the existing flooring stretched a little over time. Next gym I will definitely purchase a thicker floor. 1/4 inch is not recommended for commercial application but I wasn't going to pull it all up and start over. Large machines move, and when they do, they cut through these. For a home application I would highly recommend this thickness. Always purchase the edge sealer. It is well worth the few extra dollars. I bought the 1/4 inch green fleck custom cut rubber rolls. Delivery was as expected and the FedEx driver was willing to leave the pallet loaded with 9 rolls in my garage. I installed the rolls in a 35 X 15 foot room in my basement over a concrete floor, which we use as an area for our 3 dogs. I did not have any help installing these, which made for a very long day. My room is a large rectangle, but has several features I had to work around. Cutting the 1/4 inch mat was not simple, but with the help of a 48 inch T Square I was able to keep my lines relatively straight. One negative is that the ends of the rolls are not cut in straight lines. This then requires you to cut a straight edge on both ends of the rolls, which is not as easy as you would think. I truly believe if the custom cut rolls were actually cut to size (rather than just being close) and in straight lines, I would have cut my install time (which was about 10 hours) by a third. I used Capitol brand Grip Strip (Double Faced Adhesive Tape) to secure the mats to the floor as necessary. This tape worked very well and was easy to use. All in all, the rubber floor is a nice product, but the uneven cuts and untrue measurement were actually pretty maddening, especially when you pay extra for a "custom cut." I researched a number of options before deciding to go with rubber flooring in roll form for my home gym. I found the company to be helpful and responsive with good pricing. The product itself looks great and was easy to install. I did the job myself over about three hours in a 15 x 20 room. Here are a few tips: 1. Remove baseboard if you can. Allows you to anchor on edges after install and gives tolerance for cutting ends. 2. Use a sharp utility knife. Don't try to cut in one stroke, use several to cut all the way through. 3. Put a backing material underneath the rubber to cut against. I used a four foot wide 1/4" plywood. Also used to insure a square cut. I used an L square as a guide. I have one suggestion for the company - cut the ends of the rolls square. This will save at least one cut.